Financial malware threatens our banks and the safety of our personal identify and hard-earned money. Evidence from private research suggests that most endpoint security solutions offer minimal to no protection against financial malware. However, in a new test, avast! Internet Security provided 100% protection against banking malware. Variants of the banking Trojans ZeuS and SpyEye are a massive threat to the security of financial institutions and their customers. Using the so-called 'Man-in-the-Browser' (MitB) attack, this malware sits between the user and the website modifying the pages displayed in real time. Some versions of the MitB changes payment details and on-screen balances to cloak its activities. Last February, BBC news aired a program called ‘Click: Online Banking Test” highlighting the risks of financial malware and the ineffectiveness of traditional security suites against MitB attacks. Initial research was done by independent firm MRG Effitas. In a follow-up test just published, MRG Effitas tested more than 30 security software products against financial malware simulators, and avast! 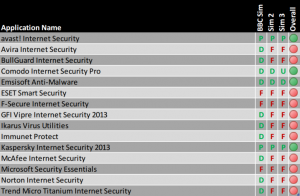 Internet Security was one of only two anti-malware and internet security applications to get a perfect score. For banking and other financial transactions, like online shopping, avast! Internet Security is a smart choice because of SafeZone™. The avast! SafeZone is a security feature which lets you browse the web in a private, secure environment, invisible to the rest of your system. This ensures secure financial transactions when banking or shopping online. The secure browser window auto-prompts avast! Internet Security users whenever it would be more secure to use it, and it opens easily from their normal browser. Read our press release for more information and a link to the report.